Tony Wilson has spent his adult life as an educator. But he grew up a fan of pro wrestling. 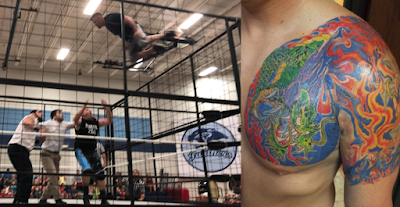 In May, those worlds collided as Tony stepped inside the steel cage at his new place of employment, Pinckneyville High School. Tony had been principal at Murphysboro High School until making the change for this upcoming school year. Tony and his partner, fellow educator Josh Plumlee (the Stone Cold Plumster) were successful in their match against DR Party members Dexter Roswell and Brian Richards. 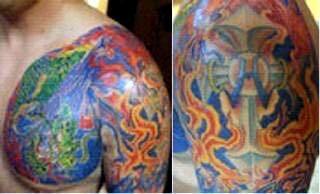 What fans may not know, Tony sports a very impressive and personal tattoo. The cross represents Tony's faith. There are two gold bands around the cross, which are from the Livestrong wristbands. Tony is a two-time cancer survivor. The H on the cross represents his daughter Hannah. The dragon on Tony's chest is also a reminder of Hannah, who loved dragons when she was a little girl. The tattoo was done by artist Dru Thornquest. As I mentioned, Tony is a cancer survivor. That has motivated him to step back into the ring. 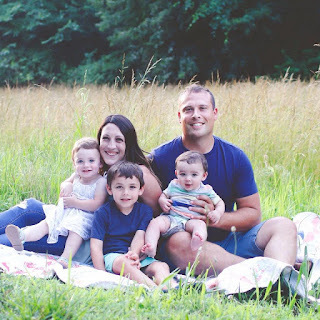 This time he'll be teaming up with "T-Dawg" Jerry Travelstead, who is the principal and superintendent at Community Consolidated School 204 in Pinckneyville. This twosome will take on a couple of newcomers in the Kellis Brothers. Saturday night's show is a benefit for Tony's friend, Sarah Miles-Keltner. The young mother of three is also battling cancer. He and the entire Stride roster are donating their time that night to help raise money for the Keltner family. There will be concessions and raffles of pro wrestling memorabilia that night too. Be there for the action at Eldorado High School. Bell time is 7 p.m.